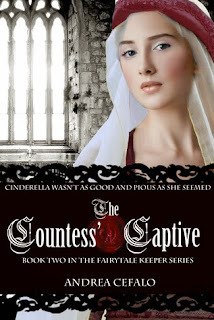 Earlier this year, I enjoyed reading The Fairytale Keeper and the author Andrea Cefalo has just let me know that her sequel, The Countess' Captive is now FREE on Amazon. From award-winning author of The Fairytale Keeper comes another masterful, historically-set retelling of Grimm's fairytales. The Countess' Captive combines Grimm's fairytale characters with real historical settings to a tale that leaves readers wondering where fact ends and fiction begins. During March of 1248, Adelaide Schumacher-affectionately called Snow White-has lost so much: her mother, her possessions, and now her home. Adelaide hates abandoning her home city, her family’s legacy, and her first love-Ivo. More than anything, she hates her father growing closer to her mother’s cousin-Galadriel. Adelaide plots to end their tryst before her fate is sealed, and she never sets foot in Cologne again. Click here to download The Countess' Captive for FREE, available until 23 May 2015.